The Orkney Islands are a sailors paradise. The islands have an eventful maritime history, from the Vikings who settled and became farmers in Orkney, to the British Navy anchored in Scapa Flow during the Second World War. The visiting sailor will find dozens of ports around the islands, where superb food and warm welcomes await them. In Stromness and Kirkwall there are new marina facilities and Chandlers. Westray also has a smaller marina, the ideal stop off during an exploration by sea of the North Isles. 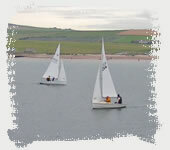 Throughout the summer there are sailing regattas in many of the islands, and the Orkney Sailing Club offers a busy social scene for sailors and their families. There are also yachts for hire in Orkney for those who just want to explore the islands by yacht - an ideal way to see the most beautiful sunsets, wildlife and coastline in Scotland. Kirkwall Marinas photo © Leonard Bain, Sailing club photo © Leonard Bain. All text © Magnus Dixon.